Last Updated: November 26, 2018 | Subscribe to our weekly newsletter! Pop quiz. What’s one of the quickest ways to run up your energy bill? Answer: your pool’s pump and filter. Running them all day long is a huge electricity drain. The thing is, you can’t not use them because they’re crucial parts of your pool’s circulation system. Sure, you could turn your filter system on and off yourself so they use less electricity. Or you could save yourself time, money, and hassle by getting an automatic pool timer. It keeps your pool running on a regular schedule so your water stays clean without creating outrageous electricity bills. And you won’t have to lift a finger. What Are Automatic Pool Timers? No, they’re not for when you need to get out of the pool to avoid getting too pruny. These specialty timers turn your filtration system on and off to reduce your energy costs while keeping your water properly filtered. If you’re trying to save money, running your filtration system at lower speeds or for less time can help. However, one of the most common pool maintenance mistakes you can make is not running your pump long enough. We recommend running your filter system for at least eight hours a day, which allows all your pool water to pass through the filter at least once. This turnover is essential to keeping your pool water clean, clear, and swimmable. How Does a Pool Timer Work? Usually, your filter system will be plugged directly into a power source. A pool timer becomes an intermediary between the system and that source. You plug your system into the automatic pool timer, and then the pool timer into your wall outlet. The timer then disrupts the connection between your system and the power source whenever you set it to do so, and then reconnects the power when it’s time to turn your system back on. It’s a largely mechanical system, which is why a lot of models look like an extension cord with a massive box and clock combination on one end instead of additional outlets. Newer models may be smaller and come with extra benefits like a Bluetooth connection for easy management from your mobile device. Still, the more affordable models get the job done just as well without all those fancy bells and whistles. Why Not Just Filter All the Time? Running your pool’s filtration system 24/7/365 is undoubtedly the best way to keep your water clean of particulates, but it’s not truly necessary. It’s especially unnecessary if you’re trying to control your energy bill. The average residential pool pump uses about 3,502 kilowatts an hour (kWh) annually. Compare that to your refrigerator, an appliance that runs all the time. Newer-model Energy Star refrigerators use an average of about 561 kWh per year. So running a pool pump 24/7 is like having six refrigerators in your house. And that’s not even considering high-powered pumps, which can use upwards of 4,300 kWh annually. All this power adds up. Conventional pumps can add about $450 to your yearly power bill, while variable-speed pool pumps cost between approximately $100 and $200. If you’re thinking in terms of pool ownership—years, because you want to enjoy your pool for a long time—you’d be looking at an extra $4,500 in energy costs if you ran a conventional pump all the time. And we aren’t even talking about the age of your filtration system. Even if you care for your system properly, the motor runs downs after a while. If your pool pump makes continuous noise, is slow to start, is more than seven years old, or seems to be losing its will to live, you’re probably spending way more on your energy bill than you need to. Reducing the amount of time your pump runs helps you save on energy costs and can help extend the life of your motor. Not to mention, the less energy your home consumes, the better it is for the environment. I Have Alarms on My Phone. Why Bother Getting a Timer? We’re all about a DIY, can-do attitude around here. But you have to balance the perceived savings of doing it yourself with the potential effort and risks. If you forget to turn off your filter, you risk running up your power bill. Even worse, if you forget to turn your filter system back on, you risk completely wrecking your water’s chemistry balance. So do yourself—and your pool—a favor and err on the side of caution with an automatic timer instead. Your filtration system, your wallet, and the environment all deserve a break from constant energy use. A pool timer is the best way to address all of those problems without adding an extra item to your already-packed to-do list. Between its three timing features and a 7-day programmable timer If you click this link and make a purchase, we earn a commission at no additional cost to you. , you can do a lot for a little with the Woods heavy-duty digital timer. Each day can be specifically programmed, or you can choose to separate your timing between weekends and weekdays. The digital display allows you to program down to the minute, so you have complete control over when your pool filtration system turns on and off. 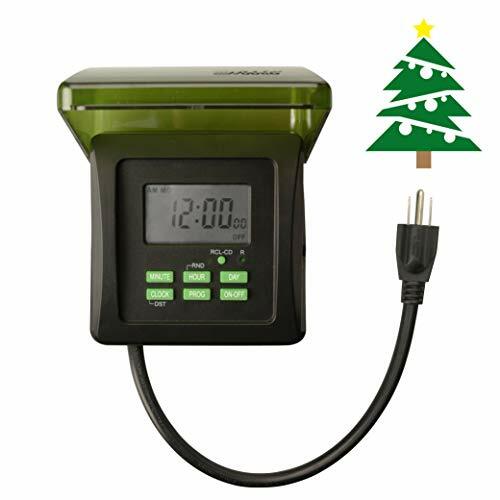 The automatic timer comes with a self-charging backup power to retain your settings in the event of a power outage, so you don’t have to reset it every time. It also comes with a weatherproof outlet switch. The best part? You don’t even have to mount this to anything to get started. 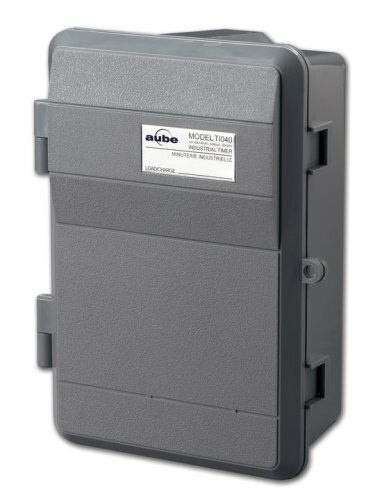 It may not give you the flexibility other timers offer, but the Aube by Honeywell has both 7- and 14-day programming as well as three operating modes If you click this link and make a purchase, we earn a commission at no additional cost to you. . You can turn your pump off manually, automatically, or through a temporary bypass. This third function allows you to override the system without disrupting your regular timer. The timer runs for 16 hours a day and turns off your pump at whatever time you set. 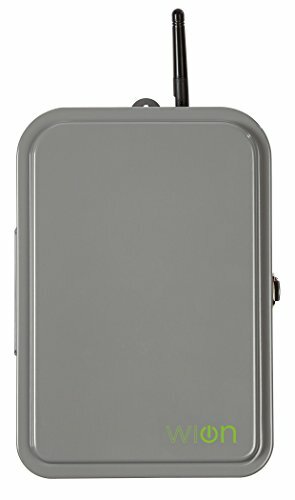 The casing is weatherproof as well as lockable, although a padlock is not included. If you’re looking for a basic pool timer, look no further. You don’t have to fiddle with any settings to set your pump timing. All you have to do is stick two pins into the machine’s clock—green for start and red for stop. It doesn’t get much easier than that! The timer comes with a waterproof cover and a 12-inch grounded cord. Plus, it has a manual override If you click this link and make a purchase, we earn a commission at no additional cost to you. if you ever need to stop or start your pump outside the regular schedule. Protected from weather and unwanted people in a metal, tamper-resistant case If you click this link and make a purchase, we earn a commission at no additional cost to you. 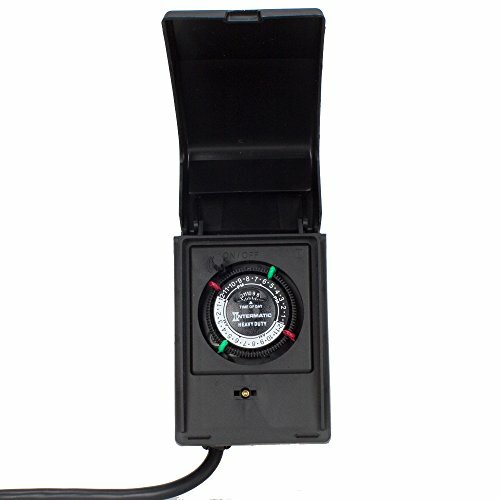 , this mechanical time switch is a secure way to control your pool pump and filter. It mounts easily to your wall at a single point and is built to last. The only downside to this one is you may want to hire a licensed electrician for the installation. Looking for something simple and affordable? 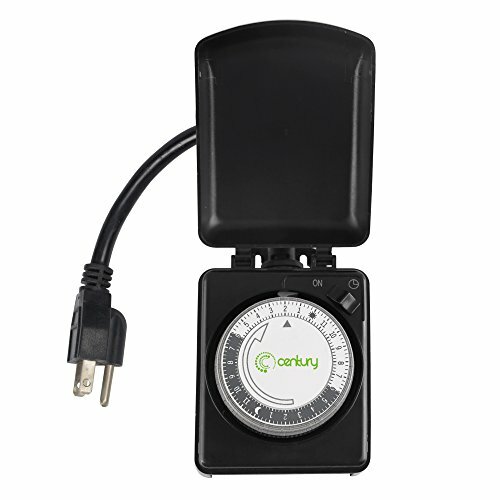 The compact timer from Century is an ideal option that does just as much as you need it to. It has two grounded outlets If you click this link and make a purchase, we earn a commission at no additional cost to you. so you can set timers for your pool pump and, say, outdoor lights. The timer is mechanical, so all you have to do is push pins up and down to set it and forget it. If you prefer to mount your pool timer on a wall near an outlet, the heavy-duty mechanical time switch from Woods might be a better option for you. It doesn’t have the customizability of other models, but you can program up to 24 on/off daily settings If you click this link and make a purchase, we earn a commission at no additional cost to you. that repeat like clockwork. The timer is kept in a lockable metal box with non-removable pins on the gear train for extra security (padlock not included). 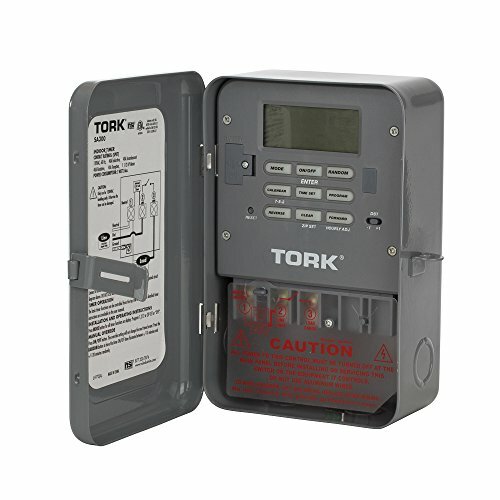 Between a lifetime warranty and a one-step setup, the TORK Zip-Set time switch from NSi Industries is well worth the price. All you have to do is enter your zip code, and the timer automatically creates a timer program If you click this link and make a purchase, we earn a commission at no additional cost to you. that kicks your filter system on at sunset and off at sunrise. You can also program it for a weekly or weekday/weekend schedule. 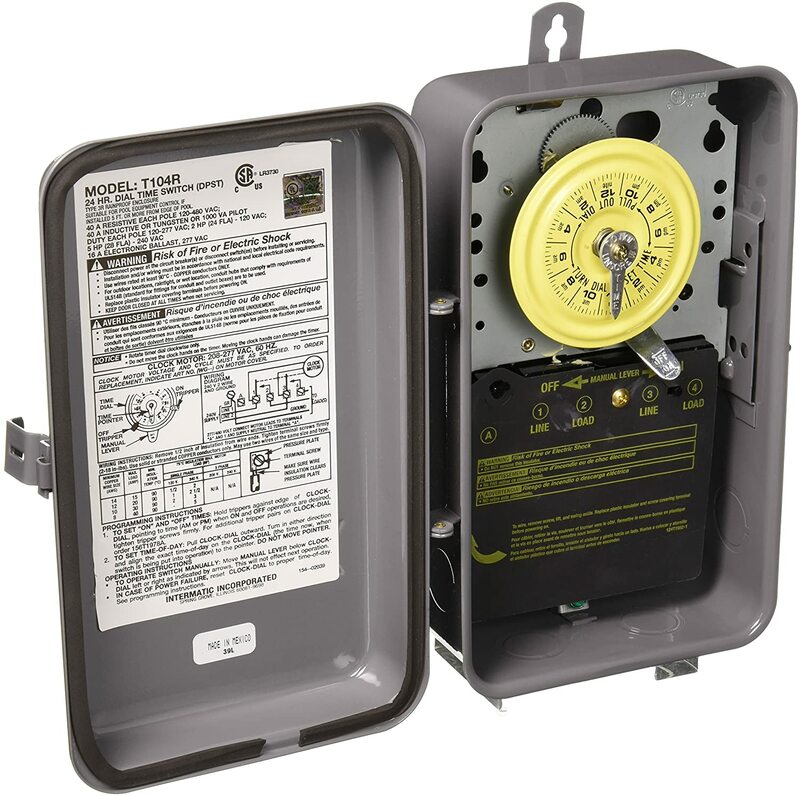 The TORK Zip-Set also comes with a manual override and a simple daylight saving time switch. Managing up to 12 appliances in a 24-hour period If you click this link and make a purchase, we earn a commission at no additional cost to you. 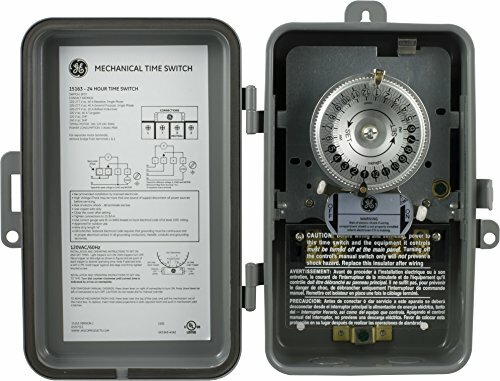 , the Intermatic mechanical time switch can really help you out if you want to coordinate your outdoor lighting, your pool pump, and a few other backyard extras. 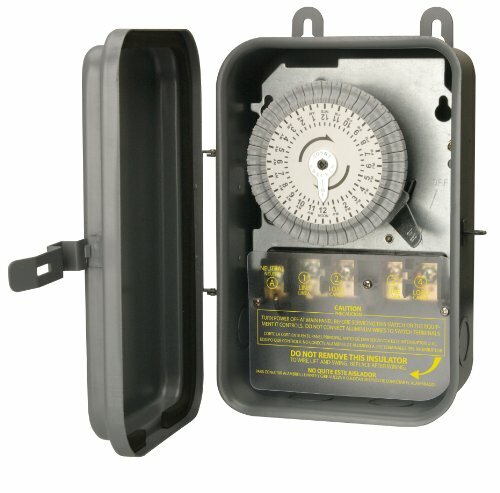 Mounted to the wall in a protective case, it’s a good option for you if you need an outdoor electrical timing overhaul. If you’re all about having the latest tech, here’s the pool timer for you. 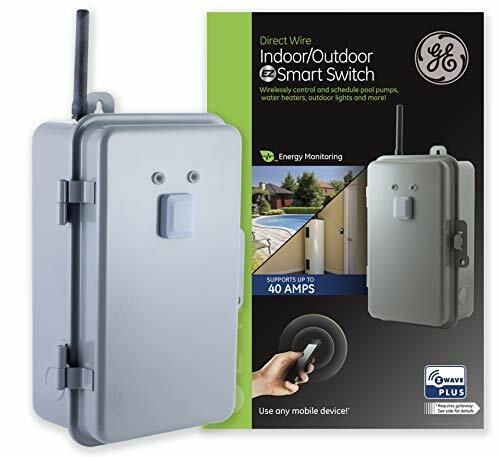 The WiOn outdoor Smart Box uses your home’s Wi-Fi If you click this link and make a purchase, we earn a commission at no additional cost to you. to allow you to schedule and control up to 12 appliances—including your pool’s filter system—directly from your mobile device. The app is free to download. WiOn also offers a variety of outlets for indoor appliances, if that’s something you want in your life. Love your Alexa? You’re going to love this. The Z-Wave Plus from GE is an automatic appliance and pool timer control system that can be managed from your mobile device or controlled by Alexa. The system comes with a lockable, tamper-resistant metal case for the outside device, as well as a security network to help protect you from hackers If you click this link and make a purchase, we earn a commission at no additional cost to you. . The hub for this switch is sold separately, but it’s a pretty nifty tool if all you want to do is tell Alexa to turn on your pump system before heading outside for an out-of-schedule swim. You know how they say time is money? When you’re dealing with how long you’re running your pool pump, time literally ismoney. If you’re tired of looking at a monstrous electricity bill, a pool timer can help you reduce costs while keeping your pool consistently clean. The best part about pool timers is they’re automatic once you set them up, which means you don’t need to add another chore to your to-do list. Hooking up a timer to your filter system is one of the fastest and easiest ways to reduce the cost of your pool, and enjoy it even more. 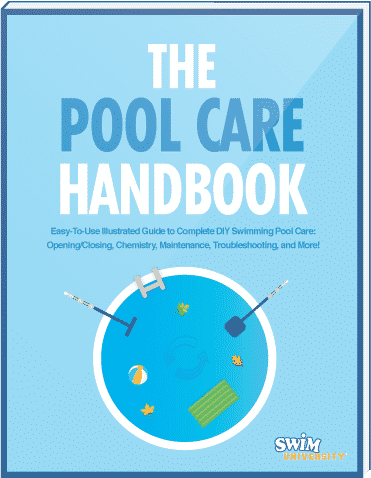 Tired of wrangling that manual cover onto and off of your pool every season? Invest in an automatic pool cover, and save yourself time and a sore back. Make every pool care task automatic, from filtering to vacuuming. Add voice-assist technology and apps to make using your pool convenient and even more fun.